You've got a Zombie Survival Plan, right? If not, why don't you? Humans live in constant fear of the brain-consuming living dead because the very idea of a reanimated corpse is terrifying. Luckily, whether you've got a plan or not, Valve's Left 4 Dead is as good as it gets to further educate yourself on the potential dangers of the impending apocalypse  or to see if your plan holds up. But the gruesome first-person shooter has a couple quirks that rock the foundation of everything we thought we knew about the undead menace. Firstly, they don't brainlessly lumber around waiting for you to put a bullet in their brain  they run, scratch, kick and violently try to rip you a new one. And they aren't alone. They'll come in bloodthirsty packs if you give them the opportunity (which you'll be forced to do numerous times). Multiple variations of special "Infected" include the pouncing "Hunter," vomiting "Boomer," and the gargantuan "Tank." Their deadly super-attacks are a constant threat, especially when making an exciting vehicular escape during the finale of each "movie's" fifth act. Because Left 4 Dead is so centrally focused on four-player co-op, you'll need to coordinate to get the best of the ever-changing AI. Far from just another mindless shooter, L4D encourages you to stick close to your team, patch each other up when wounded, and cover all of the angles when someone mistakenly sets off a car alarm, thus summoning a stunning amount of enemies. Ideally, each play-through is completely different from the last, but you'll start to notice familiar patterns as you continue to complete the nearly story-free missions. For example, upgraded weapons appear in spot A or spot B, and the Tank spikes intensify once you cross a certain threshold. Nevertheless, there's enough variety to add longevity to the experience with the mixing up of enemy spawn points, grenade locations and med-pack cabinets. If you find yourself exhausted from surviving as the four endearing characters  Bill the grumpy war-vet, Louis the nervous nerd, Zoey the fearless college kid, and Francis the vitriolic biker  you can switch gears to competitive multiplayer in Versus. With two teams of four, your squad alternates between Survivors and Infected, giving you control over the aforementioned special zombies as you try to foil your opponents' escape. The Infected team requires precision cooperation, perhaps more so than the rifle/shotgun/machine-gun toting humans, as you're quite vulnerable as a zombie. Lengthy respawn times might turn some away from the mode, and impatient people will find themselves staring at that countdown a lot if they're not willing to wait for the perfect opportunity to strike. Acting alone will earn you a shotgun blast to the face, so cooperation is crucial. Sadly, only two of the four possible campaigns are available in Versus. The multiplayer mode adds excellent legs to a shooter that you might otherwise tire of after a couple completions, but after extended play you'll certainly start to become bored of looping the same stages. Even so, it is without a doubt addictive and fun to blast your way to the next safe house as you flee from the horde, protect your friends, avoid the lethal one-hit-kill "Witch," and make smart use of multiple tactics. 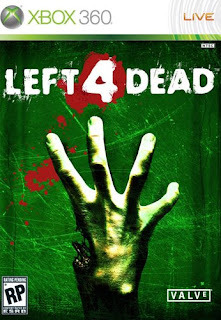 L4D slowly becomes more formulaic than frenetic, which doesn't play well in to the themes of the game. Moments that previously haunted you, such as rooms filled with shredded corpses, eerily silent sewers, and the trumpeting crescendo that signals an incoming swarm become routine rather than emotionally evocative. Still, it's impossible to resist the urge to fight off the attacking mass of bloodthirsty Infected in a desperate struggle to survive. More campaigns would definitely have been appreciated, because you'll breeze through the entire game in six to eight hours. Because the AI is constantly changing, if only slightly, every match does manage to feel different. With a breadth of witty character dialogue exchanges to listen to, the dread of death can briefly be alleviated with a whimsical comment or ironic joke, too. And with the addition of Versus multiplayer, you'll have plenty of horror to experience as you strangle, shred and smack human players around. So, it's not for a lack of things to see and do that Left 4 Dead feels slightly limited; it's the limited places to experience these moments that hurts. Left 4 Dead is a fantastic twist on an established (and played out) theme. With very little story to speak of beyond scribbles on walls, there isn't very much depth to anything but the combat, which is endlessly entertaining regardless of how long you play. It's just a shame that many players will become bored once they've finished the campaigns, especially if they're not into the competitive mode. For the rest of us, there is no end. Only survival. And we'll contentedly shoot our way to whatever boat, chopper or plane wants to take us to our next terrifying co-op adventure.